You see, we can win on TV! 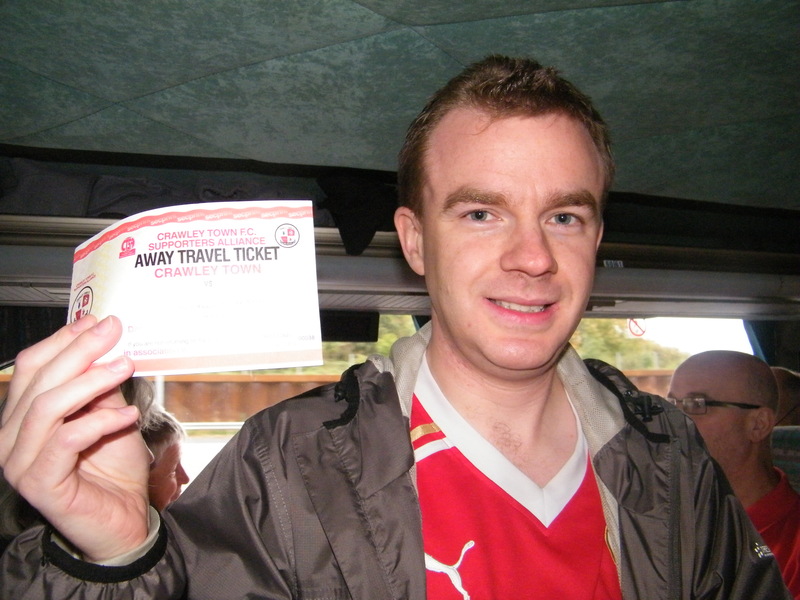 James Charlton scored 31 out of 32 on Travel Ken's famous quiz and won free travel to AFC Wimbledon. Far too clever by half.....! There was some good stuff happening on the pitch as Matt Tubbs opened the home defence on 23 (mins). While there was a late scare as the Cobblers hit the bar Crawley comfortably held on and were cheered off the park by the 249 travelling support. 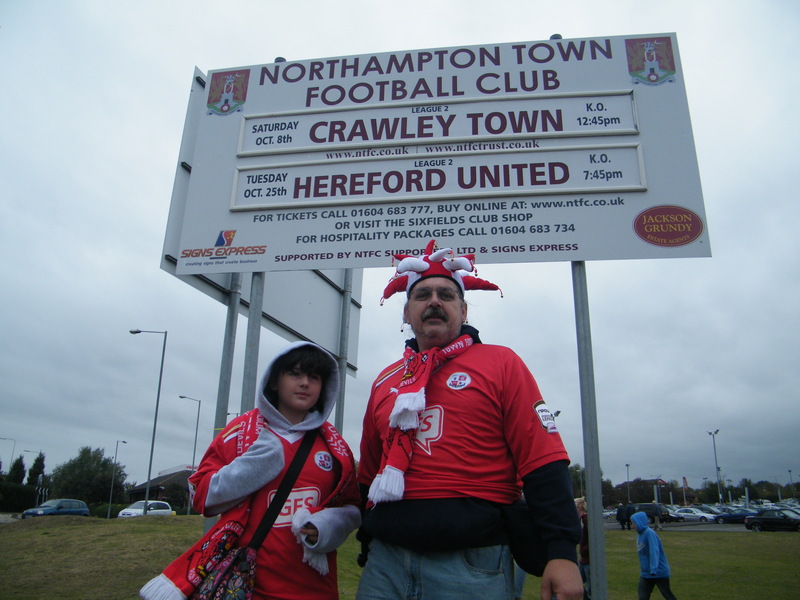 CTSA and West Stand season ticket holders Dave Taylor and daughter Kaitlyn (11) enjoyed their first CTSA coach trip. Dave said ‘ it wasn’t what you might describe as a classic but both teams created some scoring chances, our defence held firm and it is great to be travelling home with 3 points!’ Kaitlyn revealed ‘ a missed Matt Tubbs shot came into the crowd and hit me on the arm’. Still, no harm done, and we’ll allow him to miss one occasionally! The Taylors will definitely using the CTSA coach service again. That’s another successful trip under the belt for the fledging Suporters Alliance. The next chance to travel will be an exciting visit to AFC Wimbledon on 22nd October leaving the Broadfield at 12.30pm. Getting to Kingsmeadow by car or train is a real pain and the Alliance is expecting a large take up for it’s coaches at £10 for all (£5 for juniors). It should be a humdinger of a day. But please contact Travel Ken to book as soon as you can- we had to turn away people who wanted to book for Northampton as the coach was full, but if they’d booked earlier, we could have got an extra coach! We don’t want to leave anybody behind ever again. Watch out for further extraordinary travel offers to Hereford, Rotherham and Crew. All 3 can be done for £35 !! Contact travel Ken on 0784312484 or travel@ctfcsa.co.uk – or alternatively book directly with the club during office hours or at the Alliance cabin on matchdays. 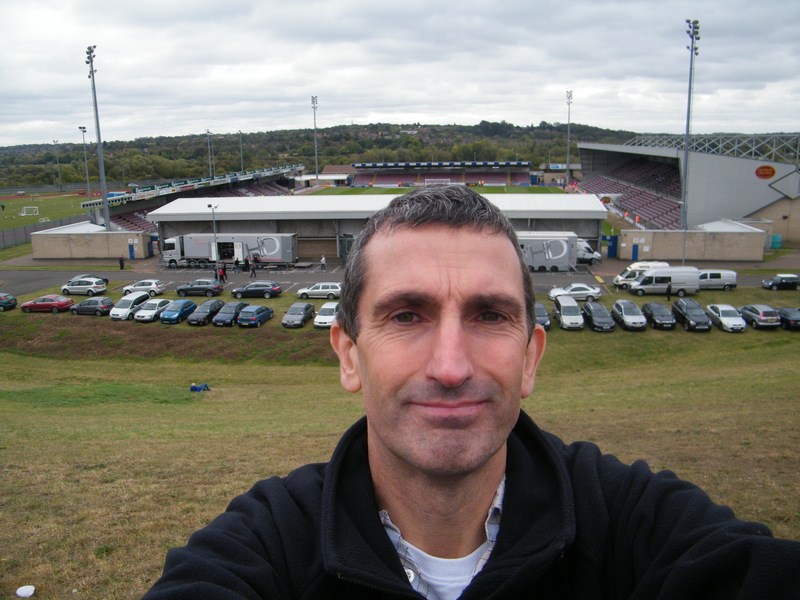 CTSA Press Officer Colin Bowman expertly lines up a shot of Sixfields Stadium, then absent mindedly forgets to get out of the way!